His crazy mask and explosive mixes have claimed the hearts of millions all around the world. 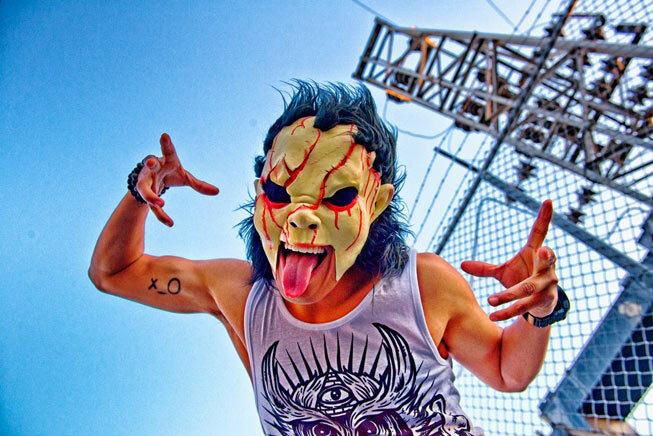 But now it’s time for DJ Bl3nd to take over the Marquee Sydney decks next weekend for one extreme night. Starting off in 2009, DJ Bl3nd found it difficult to grab anyone’s attention. It wasn’t until he started to create live videos of himself spinning turntables and dancing that people started to notice his talents. And in just a few years, he quickly rose to stardom with over 250 million views on his YouTube videos and millions of followers aka ‘Bl3nder’s across his social media profiles. Now, his high-energy mixes and unforgettable onstage presence has taken him on his first world-wide tour with his next stop – Sydney, Australia! I was lucky enough to catch up with DJ Bl3nd to find out more about his music, his inspiration and plans for the rest of the year. So who is the man behind the mask? What are his likes, his dislikes? Well I like to eat healthy, I like to eat clean. My dislikes would only be I guess fast food – I don’t like burgers. You can say I’m kind of a health freak. I mean America has so many good burger joints, I’ve tried them all years ago but now I’ve stopped. Congratulations on kicking off your first world-wide tour! You must be so excited; where are you looking forward to Djing (besides Sydney of course)? Thank you! Definitely, it’s my first world-wide tour and I just played South America last week and it was an amazing experience. I cannot wait to go to Australia and all around Europe. What I’m looking forward to the most is being able to reach every fan that I have around the world – Australia, Asia, Europe, everywhere. It’s going to be a great experience to finally do so after so many years. You have such a huge global fan-base – I mean over 4 million likes on Facebook and more than 176,000 followers on Twitter. Does it get overwhelming sometimes with the amount of people talking about/to you? Yeah it was hard to believe at first, knowing that I had so many fans but I just keep it going for them now and deliver them what they want, like my crazy videos and crazy music. It’s not really an overwhelming thing. I love it, I love that so many people support DJ Bl3nd. I read somewhere that you’re a fan of hardstyle (so am I!) Is that what inspired you to make such high-energy mixes and performances? Yeah! Hardstyle music is very, very energetic. It’s so fast and just keeps you moving the whole time. But when I stepped into the 128bpm I wanted to get that same feeling so I try to deliver that in my mixes. Even though they’re at 128bpm, it’s still super fast-paced and high energy with all the crazy sounds. Other than your hectic mask, you’re famous for ‘raging’ on stage. What is ‘raging? Raging is just letting yourself go. You don’t have to think about anything or a have care in mind, just follow the music and rage with the music. That’s what raging is to me, I just dance the way I feel with the music and sometimes there are no rules. It’s like when people tell you to ‘Dance like nobody’s watching’ – that’s raging! So your career has taken off quickly in the past few years, what other projects do you have coming up for the rest of 2014? I have a lot of things coming out in the following months including music videos and my 10-minute mix videos that my fans like so much. And also I’ll be playing at a lot of big festivals in Europe and Asia. I have the World’s DJ Festival in Korea, We Are Festival in the UK and other festivals around the world. You’ve played at international festivals before, such as Tomorrowland 2013, what’s it like? Honestly, every festival is a great experience and any festival that I’m able to headline is something that I would not have expected. So it really is a pleasure and honour for me to play at any festival. What can Marquee Sydney expect from your performance next weekend? A lot of energy! *LAUGHS* A lot of raging as we spoke about before and just a good time. Just something different and out of the ordinary. It’s going to be my first time in Australia, both visiting and performing and I’m pretty excited for it. Every place that I go to I try to see as much as I can with the little time that I’m there for and I definitely want to visit all the places that Australia is known for. I also have a couple of friends down under who I’ll be meeting up with in the studios and hopefully do some collaborations. Any superhuman power?! The first one that always comes to my head is to be able to fly. To be able to fly or teleport myself anywhere that way I don’t have to be on long 24 hour flights and get anywhere quickly. Like Superman! Any last words for us Down Under? I’m ready for you Australia! And I cannot wait to see what you have in store for me and I hope you all go as crazy as I do. Grab your tickets here to catch DJ Bl3nd at his Marquee Sydney debut on Saturday, 26th April.